MANILA, Philippines - The June 2017 Architect board exam or Architect Licensure Examination (ALE) official results to include the complete list of passers, top 10 (topnocthers), top performing schools and performance of schools were released online in two (2) working days after the exam. UPDATE: 1,490 out of 2,679 passed the exams, PRC advised on Wednesday, June 28. The Professional Regulation Commission (PRC) and the Board of Architecture (BoA) conducted the licensure exam in Manila, Baguio, Cebu, Davao and Legaspi on June 23 and 25, 2017. From July 10 to 14, registration for the issuance of Professional Identification Card (ID) and Certificate of Registration will be done on-line. Please go to www.prc.gov.ph and follow instructions for initial registration. According to PRC Resolution No. 2016-1019, which deals with the 'Schedule of Licensure Examinations for Year 2017', the target release date of Architect board exam result is on Thursday, June 29, or in 3 working days after the tests. However, results are possible to be released ahead of the target or on later date, without prior notice. Note that June 26 was recently declared a regular holiday for Eid'l Fitr celebration. In the same period last year, results were released online after 3 working days. 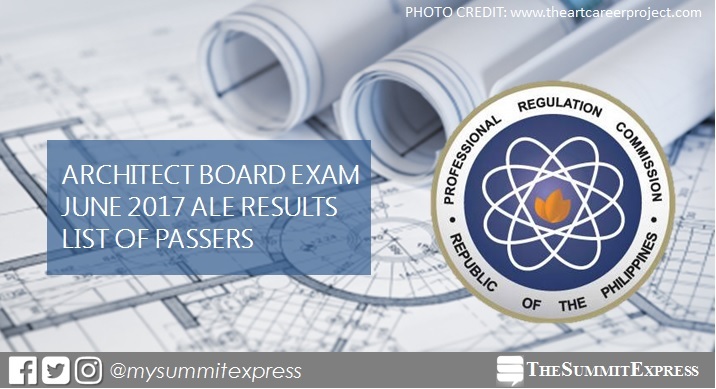 PRC named 1,243 out of 2,224 who have passed the ALE. In June 2015 exams, results were out in 5 working days. A total of 1,201 out of 1,964 passed the tests. Technological University of the Philippines (TUP) - Manila was the only top performing school in the June 2016 architecture board exam, 86.79% or 46 out of 53 passed the exam. In June 2015 exams, University of Santo Tomas (UST) and University of San Carlos (USC) topped the board exam, 88.74% and 85.92% passing rate, respectively. Which school do you think will top the June 2017 ALE? In few days after the release of results, the Verification of Rating (VoR) page of PRC for June 2017 ALE will be available online. Enter the required information - exam name, exam date, application number, name and birthdate to verify identity. The Summit Express will update this page immediately once the results are officially released online.